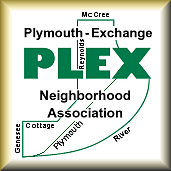 The Plymouth-Exchange Neighborhood Association serves the Plymouth-Exchange Neighborhood. They meet on the second Tuesday of every month at Carlson Commons, 70 Corretta Scott Crossing, at 6:30PM. All neighborhood residents and other interested persons are welcome. As of 2015, the president is Dorothy Hall. PLEXNA dues are two dollars a month. PLEXNA has an office on South Plymouth Avenue. Unfortunately, due to financial constraints it is not currently staffed. Anyone interested in volunteering to work at the office should contact PLEXNA or come to a meeting.